United Sign: That's a Wrap! What some might consider vanity, is really a very practical and smart way to advertise your business. 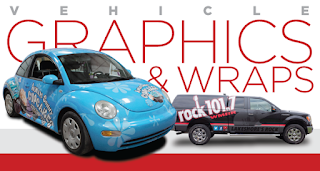 Let's take a look at a few things about a vehicle wrap you might otherwise not think of. First, your presence. Do you really think people are diving into phone books anymore looking for your product or service? Is a TV ad campaign out of your reach? Do you wonder about the value of newspaper or radio? A billboard for a month along a stretch of road reaches a lot of people, but will they remember it? Your vehicle properly wrapped with state of the art graphics and techniques will provide you years of visibility and if you are looking to advertise on cost per point of impression, the cost of the wrap will end up being less than you would pay for a cup of coffee per day over the lifespan of the wrap. Next, let's talk a little about the wrap. It's not a fail safe at all, but....it's a layer of protection for your vehicle. It will make the chance of a light scratch or maybe a shopping cart hitting it have less of an impact. It's printed on durable vinyl and printed with UV protected inks that will assure you don't have to worry about the job fading in a year and finally, your "advertising department" is mobile! It's getting into neighborhoods while you work, it's standing out on a street corner at a stop light, it's in the parking lot at a high school football game and let's say you want to enter a parade..... you've got your own custom float! Ok, the parade might be a little extensive but you get the idea! Stand Out! Be seen! Invest in your company and your bottom line for pennies a day. Consider a vehicle wrap from GH Imaging or if you have a trailer or box truck and want to get the word out maybe look into the Power Grip Frame System. An even more affordable way to get the message out. Click on the logo below for a "Quick Quote" on a vehicle wrap from GH Imaging. Thanks for reading!